Quick update after MWC: like I wrote in Barcelona, I expect this to be unveiled at MIX in Las Vegas, april 12-14. So it can't be long now. When you can use code contracts this is probably preferable. Otherwise, these little extension methods can come in really handy for some general cases. 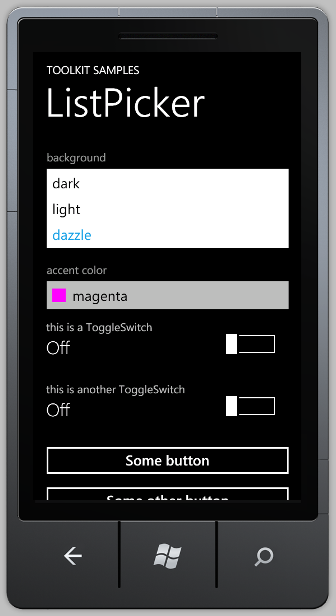 First WP7 app should be published! This morning I found out that my first Windows Phone 7 application had passed testing. It's status is now "Published to Marketplace", but I have not been able to see it appear on my phone yet. Hope it does so soon. In the meantime, here are a couple of screenshots of the application in English; it supports English, German, Spanish and, even though not supported yet, Dutch. 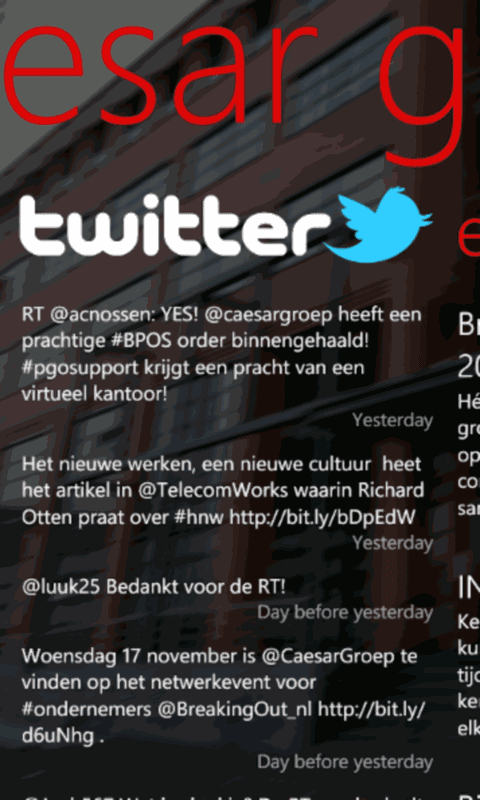 All the content that is shown (RSS feed items from my companies website and its tweets) is in Dutch only, however. Is WP7 getting another theme in its next version? Since this screen seems to do its best to mimick the Theme page from WP7 phone settings to show off one of the places where WP7 itself uses the ListPicker control (with appointment status being another one), I would not be surprised if we would see a new "dazzle" theme in a next version of the Windows Phone OS. I admit that a launch of the magnitude of Windows Phone 7 is no easy thing. And that I didn't really get active in WP7 application writing until the LG developer prototype device from Microsoft arrived two weeks ago. But still. I have been wanting to publish at least one WP7 app to the marketplace for almost those two weeks now. 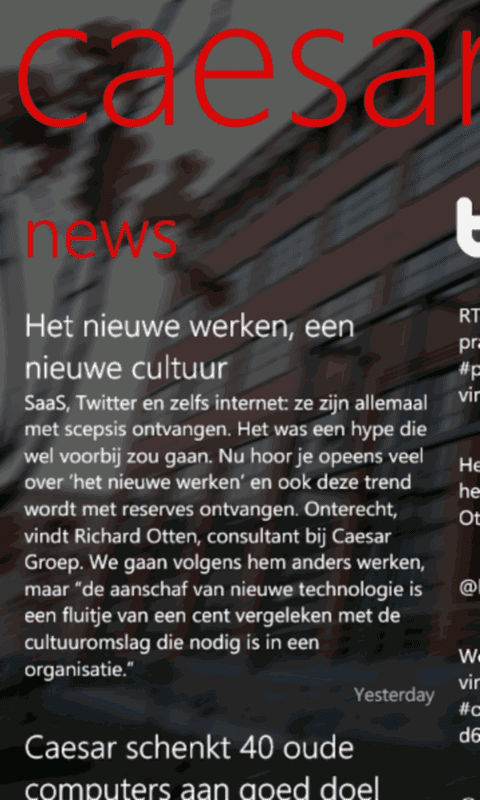 Thanks to Microsoft NL (way to go, Matthijs!) 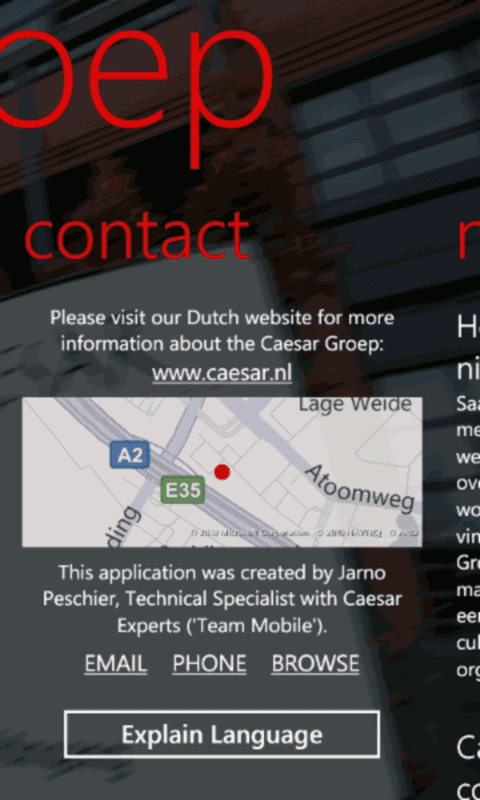 I should have been white-listed for WP7 app publishing already, but so far this has not materialized. The App Hub forum seems awash with developers in a similar predicament. Without a real solution in sight. I would definately not want to be on the WP7 App Hub team right now. Good luck the coming weeks, guys! Will you please include full namespaces in your example code? For people not yet well versed in the .NET API that you describe or use in your code, nothing is more frustrating than copying a couple of lines of code from a blog and then finding out that it doesn't compile because they have not referenced the right assembly and/or included the needed using statement for the namespace. What would you prefer to find as an example in a post that describes how you can let Windows open a website in the default browser by simply starting a new process with the URL as the commandline? You find the Process class in the System.Diagnostics namespace. To me any option is fine, except the last one. With my personal interest in maps and mapping I read the blog post about Google Maps on WP7 (using the Bing Maps Silverlight control) by LocalJoost with great interest. He mentioned a lot of pageviews to this post shortly after posting it, and I just saw him tweet about his post being picked up on by wpcentral.com. I suspect that Daniel is both Microsoft biased (not really a problem for me) and not based in the Netherlands, because even though I hear a lot of positive things about Bing Search and Bing Maps, I keep comparing it to Google Search and Google Maps and have not switched yet. To be frank and rather blunt about it: Bing can't stand in the shadow of Google. Or at least it cannot in the Netherlands, which happens to be where I live and use these services almost exclusively. Before anyone starts comparing actual mobile client features I want to point out that this is mainly related to (probably) legal and data issues and not to the technology. I just have the feeling Google in general "finds more" for me, gives me more useful results. Also, I like the visual style of Google Maps more than that of Bing Maps at the moment, but that could just take some getting used too. So for now I'll take Google over Bing any way I can get it. And that includes a Google Maps client for WP7, preferably written by Google itself and including all the official Google Maps features. If you follow me on Twitter you probably know that I am in the process of learning how to fly RC helicopters. Recently I got a question about simulators, specifically if there were any open source/free ones around. A silly, arcade like Java "simulator"
Hovercontrol.com seems to be related to helicopter simulation with/in Microsoft Flight Simulator? If you know of anything that should be in this list that I missed (didn't put that much time into compiling it), please let me know in the comments. One last comment: if you are (or become) serious about flying RC helicopters, I think it will be imperative to have simulator software that has a physical USB transmitter available or at least the means to attach and use one. What you have in your hands while simulator flying should really be as close as you can get to what you will be flying your actually helicopter with. This helps to train muscle memory and make you a pilot instead of "just" a gamer trying to fly an actual helicopter model. If you want to know more about my helicopter adventure, please check out my personal blog (which is in Dutch). If you follow me on Twitter, you will have seen me rant about an alpha version of some piece of software on my phone. While I will not be naming it here, because that is just not the point, it is clearly the reason for this blog post. The application - lets call it FizzBuzz just to have a generic name - looks good, and seems to work okay (great, if you consider that it's an alpha version) except for one thing that for me made it totally useless. FizzBuzz contacts an internet service through (I think) a REST API. And at least one of the parameters involved is a decimal number. When I used the version of the FizzBuzz application that sparked this post, all I got was a fatal exception message box after which the applications was killed, which in itself was fine. So some application crashed. What gives? What's not fine however is the fact that the problem that caused the crash was a FizzBuzzException with a message a bit like "Invalid attribute 52,0987654321". The original FizzBuzz API no doubt accepts its decimal values with a dot. I live in the Netherlands however, so my phone is set to the (for me) correct local settings, which include a decimal comma. So, what went wrong? Simple: the creator of the FizzBuzz phone application seems to have been working from a faulty assumption: in the .NET framework decimal.ToString() always creates its results "the same way I'm used to getting them". And that is plainly wrong. The whole question of globalization is just completely ignored then! Globalization? Oh no, not that! Also, this post is not about the FizzBuzz phone application showing times in 12-hour time (without AM/PM indication even) and dates in M/DD numerical format. I sure would like it very much if it would show this to me in 24-hour time and D-M format (either by making use of the current Culture settings, or by letting the user choose among a number of options in its Settings), but that is again not my point here. What are you saying, then? I just think there are minimum levels of "cultural awareness" for each and every .NET programmer. And knowing that ToString() (and anything directly or indirectly using it) is dependent on the current culture is part of that. Not just getting an "aha" feeling when someone (like me) tells you about this, but using this in your daily work every day. What really helps with this is static code analysis: if you turn on rules CA1304 and CA1305 it almost becomes impossible to forget about these things. Especially if you turn on the Treat warnings as errors option, which might be a bit much for most. Another basic that every .NET developer should be aware of is the invariant culture and when to use it. Every time you are converting a value to a string for the purpose of showing it to the human user of your application, the assumption above is usually fine. Normally the .NET Framework will silently use the current culture which will be related to the local settings made on the device and everything should be peachy. However, when you are creating a string for the specific use in an API to other software - like in the situation the FizzBuzz application was converting decimal values to strings - you normally need a specific format. Or to be correct: the API you use expects a specific format. And since most software development has historically been English based, you'd better use dots in your text-formatted decimal numbers, unless specified otherwise. For this, the invariant culture is perfect. Also, don't forget about string.ToLowerInvariant() as opposed to the much more well known string.ToLower() (and the same for the variants for upper case) in situations where use of the invariant culture matters. Please adjust your basic assumptions (if you haven't already): assume the current culture comes into play when converting to/from strings at all times. When working with strings in relation to software based protocols and your "old assumptions" should hold, simply explicitly specify the use of the invariant culture. Only if you have a compelling need to (or when it interests you) should you actually read up further on the whole globalization situation, including the Turkey test, date/time/currency formats, multiple resource files for different cultures, etc. P.S. To be fair, by the time this blog post is actually published, the FizzBuzz application that was a reason for me to write this post corrected the problem and is now working fine. Just wanted to have this mentioned explicitly. If you read this blog and generally follow me online or have been doing some time ago, chances are http://www.jarno.demon.nl/ has come up on your screen at some time. Let's face it, this website is old, outdated and frankly a bit (lot?) embarrassing even. But still, I never took it down or moved it and I'm still paying the ISP I had the time just so it remains. That, and because I'm a lazy administrator, and never actually canceled. This is now going to change. I think I keep getting some job offer calls from the CV on the site. And there are also still things on there that are difficult or impossible to find elsewhere on the web, like: the ghost website of RUN Flagazine, information on the HP82240B printer (although I think this is also mirrored in the HP48 FAQ) and my masters thesis.